What to consider when choosing to keep animals (IFOAM) | Infonet Biovision Home. 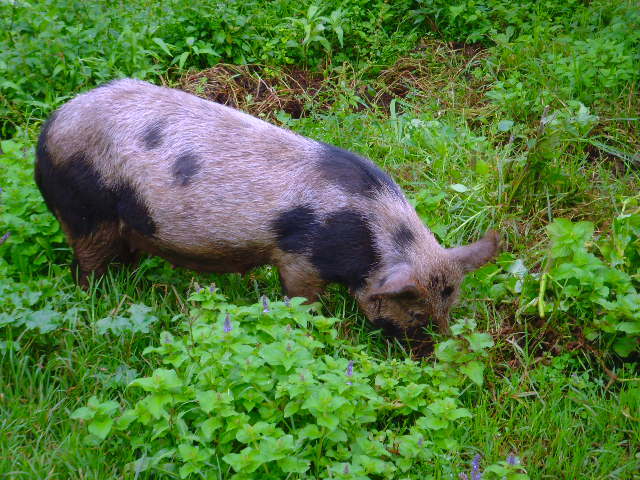 Integration of animals into crop producing farms is fundamental for many types of organic farms. In temperate and arid zones, animal husbandry plays an important role in the recycling of nutrients, while it is often less emphasized in the humid tropics. The caring, training, and nurturing of animals is considered an art in many farming communities. It is a strong tradition among pastoral communities such as the Massai in Kenya or the Fulani who live in most Sahelian countries. 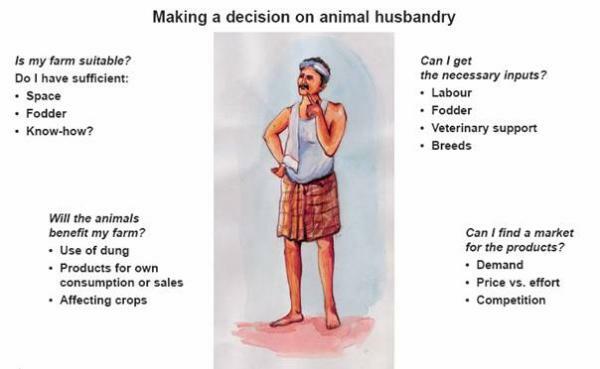 In these communities, animal husbandry is a mainstay in rural activities. 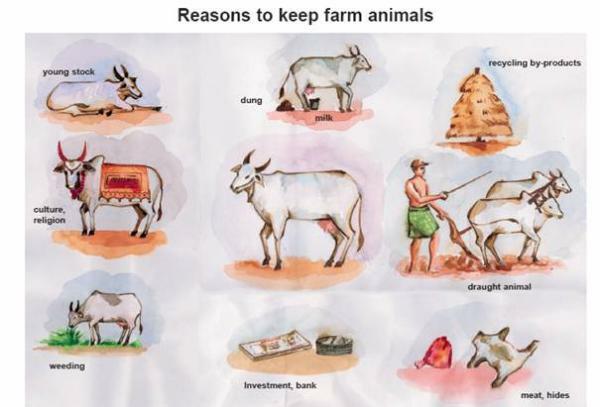 Farm animals can have many functions on a farm, but not all farms are suitable for keeping animals. 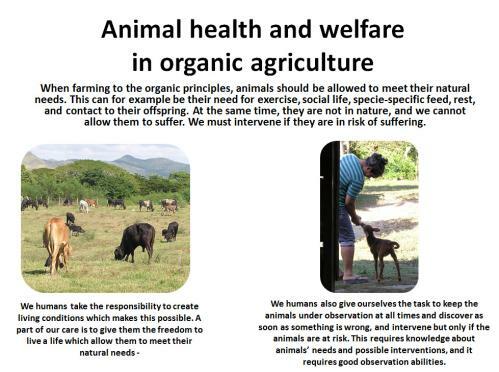 Organic animal husbandry puts a central focus on the welfare and health of the animals. Ensuring the good lives of animals by enhancing and supporting their naturalness is viewed as central in organic animal husbandry. Human care is essential. We have taken them into our households. This means that we have taken the responsibility for their wellbeing. As humans, we form the surroundings for the animals and ensure that they are safe in daily life. We are responsible for letting them live their lives as natural as possible - and at the same time, we also have the responsibility to intervene as soon as something is threatening their health and welfare, such as disease or signs of discomfort. This makes organic animal husbandry different from intensive animal husbandry, where animals are kept under very restrictive conditions, where their natural behavior is not supported. The welfare and health of the animals must be supported in all aspects of animal keeping: development of sheds, bedding, feed, ensuring safe outdoor conditions and taking care of the animal, when it needs care. Our consumption of animal products is generally increasing on a global level. At the same time, we face severe challenges related to climate change. We have to realize that every time we produce a kilogram of animal meat or a liter of milk, we have used much more energy and resources in terms of feed and water than we get out of it. 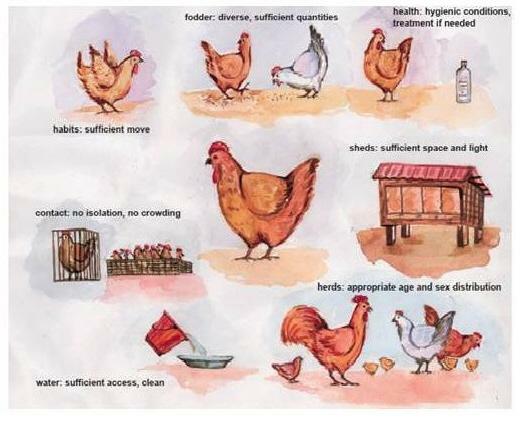 This will be discussed in more details in another place, but these also have to be considered on household level: when you compose a healthy diet for your family, animal products can add valuable nutrients but it is not healthy in high amounts, and you have to use more feed and more water to produce a smaller amount of animal products. This is also about thinking a well-balanced integration into your farm. e.g. it is recommended in some parts of the world that adults should not have more than 3 eggs per week. FAO states that meat is not an essential part of a human diet, but humans have a need for 50-60 g. protein per day which needs to be covered, but not necessarily by meat. Some sources recommend that humans eat not more than 200-300 g meat per week. The energy and water footprint of animal products is also considerably much more than e.g. vegetables. Is my farm suitable? Do I have sufficient space for shedding and grazing? How many animals can this farm sustain? Are there any particular risks for keeping animals in this area? Is water available? Does infrastructure support e.g. transport of products from my animals to the market, if relevant? Will I find a market for the products? Does anyone want to buy my milk, eggs, meat etc.? Is the price worth the effort? Can I work together with other farmers in the area to get better bargaining power when selling our products? Can I produce of a sufficient quality which is suitable for the market? Will the animals benefit my farm? Can I use the dung in a suitable way? Will I get products for my own consumption or sales? Will the animals somehow affect my crops? Can I get the necessary inputs? Is sufficient labour available within or outside my farm? Is enough fodder and water of good quality available throughout the year, especially in periods of scarcity (dry seasons or during droughts)? Will remedies and veterinary support be available, if needed? Can I get suitable breeds of animals? Which knowledge do I need on these issues, and can we get that? How many animals can my farm sustain? In tropical countries, farm animals are frequently found to be underfed. When defining the number of farm animals, keep in mind that the economical benefit will be higher when fewer well fed animals are kept. Keep in mind that not only the amount, but also the quality of the available food must be taken into consideration. Do we have sufficient amount and quality of feed on this farm, especially in periods of scarcity (e.g. dry seasons/droughts)? Where can the animals be kept outdoor, and how much can the grazing areas carry? Size of existing or planned sheds: does it fit into my farm, and can the animals have a good life there? Which amount of manure is optimum for my fields?Who has the responsibility for the animals? Who has the daily tasks? How do we distribute work? Where do we enhance our knowledge in these animal species, if needed? Who can we consult in case of crisis? Can we afford the inputs that may be necessary in terms of veterinary consultancy and treatment? Sufficient freedom to move around and perform their natural behavior in all life situations, e.g. to raise and lie down freely, groom themselves and assume all natural postures and movements. E.g. some animals (e.g. cows) want to withdraw from the group when giving birth, and this should be possible. In IFOAMs Norms (2012) it says 'The operator shall ensure that the environment, the facilities, stocking density and flock/herd size provides for the behavioral needs of the animals' and '(2c): access to resting areas, shelter and protection from sunlight, temperature, rain, mud and wind adequate to reduce animal stress'. Water should be available at all times (except for camels, they can do with water every 5-8 days) and be clean and fresh. Remember that young animals also need water! Even when they are milk fed, it is not always fulfilling their needs for liquids, especially not if active and if it is warm or hot and dry, or maybe even windy. 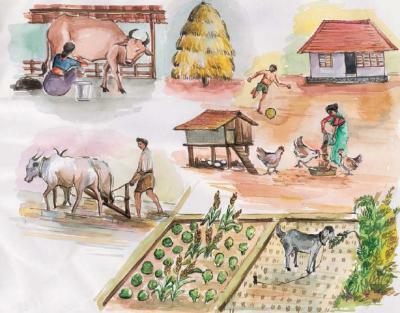 The multifunctional roles of animals give basis for a lot of different ways of integrating animals into a farm. Animal products such as milk, eggs, and meat can both be used for home consumption in the family as well as for selling, thus improving household nutrition and generating additional income for the farmer.organic animal husbandry and the idea of a harmonic integration, it is obvious that landless animal husbandry (i.e. fodder purchased from outside the farm, no grazing land) cannot be permitted in organic farming. 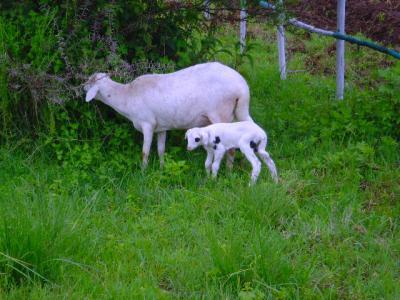 As discussed above, IFOAMs Norms 2012 emphasize the need for animals to have outdoor access, and they emphasize specifically for ruminants that grazing is a requirement: 'Ruminants (Ruminating mammals include cattle, goats, sheep, and camels) may be fed with organic carried fresh fodder during the grazing season where weather and soil conditions do not permit grazing. The organic carried fresh fodder shall not exceed 20% of the amount of forage grazed during the grazing season. Animal welfare shall not be compromised'. (under 6.7 in IFOAMs Norms, 2012). In other words, the effort to create good grazing conditions is a must, and there is not so much choice between shed feeding and grazing. 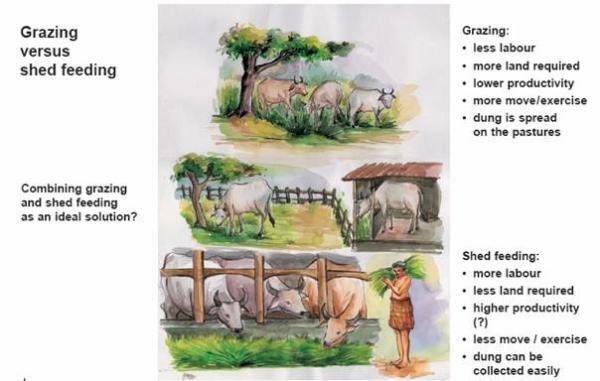 Nevertheless, the figure below can help in the discussion on how to organize the combination of grazing and shed feeding in a way, which supports the specific farmer. In most smallholder farms, fodder cultivation will compete for space with the cultivation of crops. 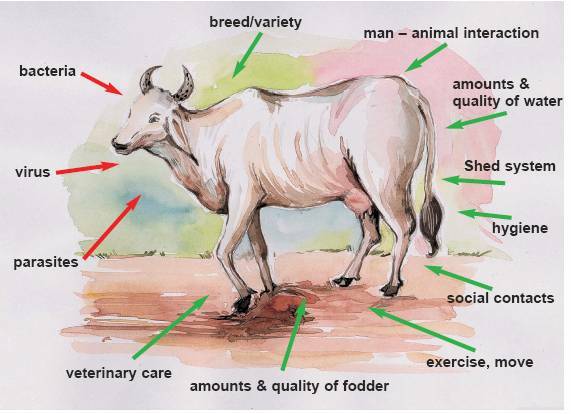 Whether fodder cultivation (and thus animal husbandry) is economically more beneficial compared with crop production must be assessed case by case. However, below are some options and examples for integrating fodder crops in farms without sacrificing much land. IFOAM Norms and Standards, 2014. Full title: 'The IFOAM Norms for Organic Production and Processing, Version 2014.